IshtyleAwhile - A Chennai based Indian Fashion Blog - A simple EOTD. 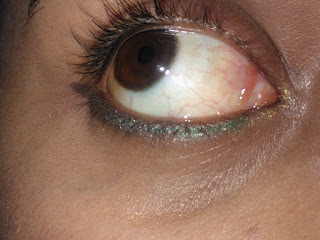 There is a story behind this EOTD. I had put up this picture on twitter more than 2weeks ago but I couldn't put up the corresponding post. The reason? Well the day I was wearing this, I had a small mishap in the chem lab.. An experiment went a bit crazy and splashed into my face. My eyes. So I had red eyes and blurred vision for a few days and I couldn't post. Then I forgot about this look and just realized I hadn't posted about it. inner corner- Golden eyeliner form Maybelline Eyestudio. Outer part and the slight flick- Maybelline Gel Eyeliner in brown swirl.. So basically a look with just Maybelline products. A very simple look that can be done in a minute. p.s. I tried and tried to take another picture where the flick was seen clearly and I wasn't looking to the skies but it just didn't come clearly. Epic Fail!